Here it is a specialty dish from Maluku Islands: Lapis Palaro. 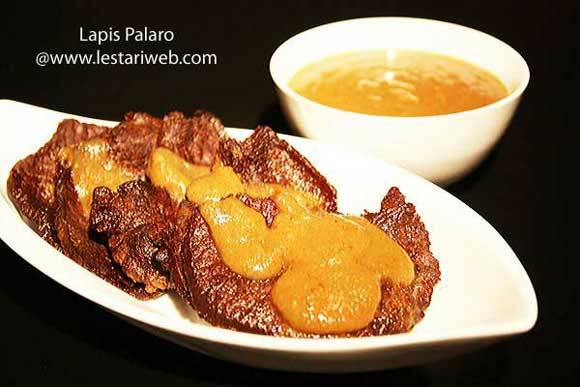 A fried beef steak served together with rich sauce, which made from Maluku's distinctive spices like clove & nutmeg, Lapis Palaro represent the real character of the only region on earth which once called "The Spice Island". Slice the beef steak agains the fiber's cut into a serving portions. Wash & set aside to drain. (If necessery add a little bit water to help the blending process). Put the beef slices & paste in a sauce pan. 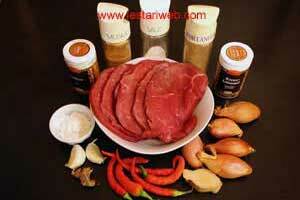 Add 750 ml water until cook over medium until the beef becomes tender. Take out the beef from the pan & set aside to drain. Measure the leftover broth for 250 ml. Heat enough oil in a frying pan. Fry the beef until golden brown & set aside to drain. Add the sago flour or corn stark mixture into the left-over broth. Bring the mixture over medium heat until got boied. Pour the sauce on the fried beef. Serve right away.